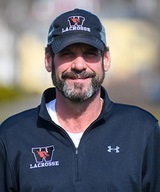 John Raba—the 2017 USILA Division III Coach of the Year—entered his 22nd season at the helm of the Wesleyan University men’s lacrosse program in 2018. Raba, who joined the Wesleyan staff in 1996, is also an adjunct professor in the physical education department as well as an assistant director of athletics. In 22 years as head coach of the Cardinals, Raba has amassed an incredible 265-113 (.701) record with 19 winning seasons and is coming off the program’s best year ever as the team captured the NCAA DIII Men's Lacrosse Championship. Wesleyan also finished the season ranked No. 1 in the country, marking its highest ranking in program history. In 2018, Wesleyan posted a 19-3 overall record and a 9-1 mark in the NESCAC. The Cardinals advanced to the NCAA Semifinals for the fourth time ever (2018, '17, ’07, ’06), and won its 12th Little Three title outright. In 2017, the team won 20-consecutive games—the longest winning streak in the country at any division—and posted single-season program records in overall wins and NESCAC victories. 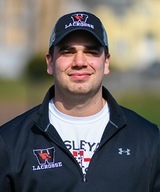 Following the historic 2017 season, Raba was named the USILA Division III Coach of the Year, the NESCAC Coach of the Year, the All-New England Co-Coach of the Year, and was awarded the Northeast Regional Coaching Staff of the Year alongside his assistants. Throughout his tenure, Raba has earned three NESCAC Coach of the Year honors (2017, ’06, ’01) since the conference’s first season in 2001, and has received six NEILA Coach of the Year laurels (2017, ’09, ’06, ’05, ’04, ’01). He has also coached three national position players of the year and 34 All-Americans. Raba’s teams have qualified for the NCAA Division III Championships six times (2018, '17, ’09, ’07, ’06, ’05) and are 14-5 all-time in the national postseason tournament. The Cardinals are also 23-15 in 17 NESCAC Championship appearances under Raba’s tutelage, and his 2001 and 2000 squads reached the ECAC New England Division III title game. In addition to coaching lacrosse, Raba assisted with the football team during the fall from 1996 through 2007, working on the defensive side of the ball each of those 12 seasons with eight as defensive coordinator (1998-2005). He stepped down from that post in 2008, assuming the position of recruiting coordinator for the athletics department. A 1993 graduate of the University of New Haven, Raba was an All-American lacrosse player for the Chargers as a grad student in 1994 after leading Division II in scoring as a senior in 1993. Also outstanding on the gridiron, Raba was a team captain, a two-time All-New England pick as a fullback and earned team MVP honors as well. He was honored by UNH as its male athlete of the year in both 1991-92 and 1992-93. He was inducted into the UNH Athletics Hall of Fame in 2010. Before coming to Wesleyan in 1996, Raba served as an assistant at New Haven (1993), Quinnipiac (1994) and with the New Haven Silver Bullets men's club team (1993-95). He also served as an assistant football coach at Brown during the 1995 season. John is a Long Island native and attended lacrosse powerhouse Farmingdale High School, graduating in 1989.